On April 28, 2015, A call came into RAPTOR Inc. about a young Great Horned Owl down on the ground. Help was sent to evaluate the situation and an adult Great Horned Owl and a sibling was found sitting in a tree near the downed owl. After checking for a physical injury and finding none, the young owl was placed back in the area with the adult and sibling. Two days later another call came in about the same young Great Horned Owl. He was not being fed by the adult owl and was constantly food-begging due to his hunger. 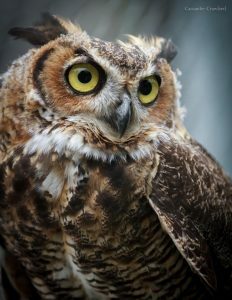 Evaluation showed this owl did not express normal behaviors; there was no mantling behavior exhibited toward humans and no effort to fly away from humans. Although, there were no physical injuries, this owl was too incapacitated mentally to recognize danger, hunt and survive in the wild. If you find an injured bird of prey and you are in the Greater Cincinnati area. Call RAPTOR Inc. at 513-825-3325 as soon as possible. We Are a Top-Rated Great Nonprofit!